Details. The code depends on python 3, Pytorch 4.1, and several other packages. For conda users, script/environment.yml provides the details of the dependencies. For pip users, setup.py lists everything needed. Data. The download_data.sh script downloads the segmentation dataset used to dissect classifiers, the segmentation network used to dissect GANs, and several example GAN models to dissect. The downloads will go into the directories dataset/ and models/. If you do not wish to download the example networks, python -m netdissect --download will download just the data and models needed for netdissect itself. The result is a static HTML page at dissect/livingroom/dissect.html, and a JSON file of metrics at dissect/livingroom/dissect.json. You can test your own model: the --model argument is a fully-qualified python function or constructor for loading the GAN to test. The --layer names are fully-qualified (state_dict-style) names for layers. By default, a scene-based segmentation is used but a different segmenter class can be substituted by supplying an alternate class constructor to --segmenter. See netdissect/segmenter.py for the segmenter base class. 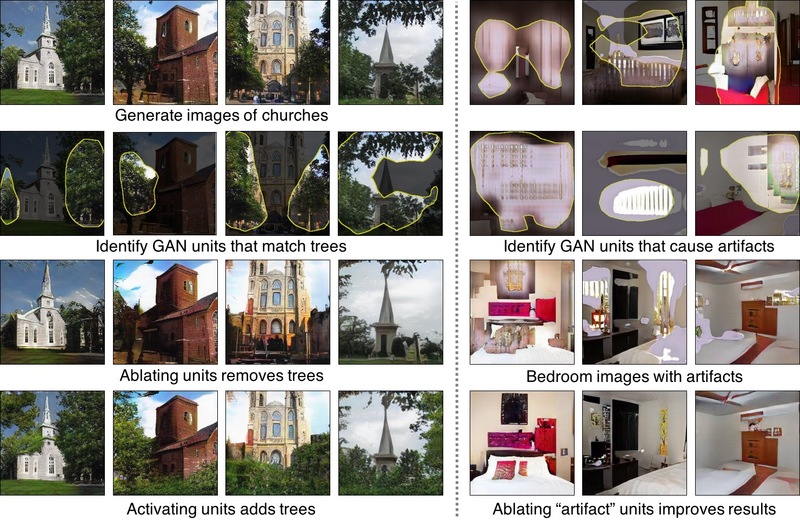 Once a GAN is dissected, you can run a web server that provides an API that generates images with (optional) interventions. http://localhost:5001/api/ui is the OpenAPI/swagger UI for directly testing GAN interventions. http://localhost:5001/data/livingroom/dissect.html static net dissection reports. http://localhost:5001/data/livingroom/edit.html a dissection-based interface for testing interventions. Load up the convolutional model you wish to dissect, and call imodel = InstrumentedModel(model) and then imodel.retain_layers([layernames,..]) to instrument the model. Load the segmentation dataset using the BrodenDataset class; use the transform_image argument to normalize images to be suitable for the model, and the size argument to truncate the dataset. Choose a directory in which to write the output, and call dissect(outdir, imodel, dataset). A quick approximate dissection can be done by reducing the size of the BrodenDataset. Generating example images can be time-consuming and the number of images can be set via examples_per_unit. 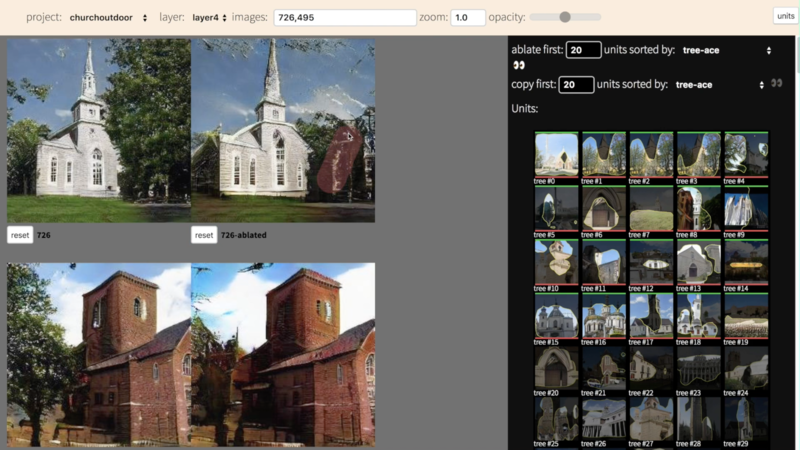 The Broden dataset is oriented towards semantic objects, parts, material, colors, etc that are found in natural scene photographs. 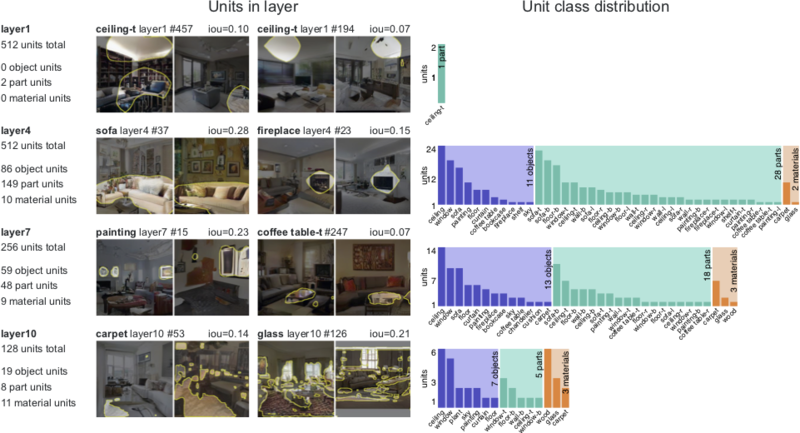 If you want to analyze your model with a different semantic segmentation, you can substitute a different segmentation dataset and supply a segrunner, an argument that describes how to get segmentations and RGB images from the dataset. See ClassifierSegRunner for the details. Load up the generator model wish to dissect, and call retain_layers(model, [layernames,..]) to instrument the model. Create a dataset of z input samples for testing. If your model uses a uniform normal distribution, z_dataset_for_model will make one. Choose a directory in which to write the output, and call dissect(outdir, model, dataset, segrunner=GeneratorSegRunner()). The time for the dissection is proportional to the number of samples in the dataset.